Home REPORTS Is This An Act Of Terrorism Against Muslims In The USA? Is This An Act Of Terrorism Against Muslims In The USA? Was the murder of three students in the US given enough media coverage? Three young students in the college town of Chapel Hill in North Carolina were shot dead on Tuesday. According to reports, the victims were students at nearby universities, from Muslim faith backgrounds and were related to each other – 23-year-old Deah Shaddy Barakat, his wife, Yusor Mohammad Abu-Salha, 21, and her sister, Razan Mohammad Abu-Salha, 19. A man named Craig Stephen Hicks, 46 (pictured above) has been arrested and charged in connection with the murders. He has expressed atheist and white supremacist views on Facebook, according to reports. Activists online accuse major media outlets of failing to adequately cover the shootings. The hashtag #ChapelHillShooting has been used more than 300,000 times and was trending not only in the US but also in the UK, Egypt, Saudi Arabia and several other Middle Eastern countries. An Arabic hashtag, which translates as ‘Chapel Hill Massacre’, is also trending with more than 13,000 tweets. The tag seems to have been started by Abed A. Ayoub, the legal and policy director of the American-Arab Anti-Discrimination Committee. “Please keep the family of the victims in #ChapelHill in your thoughts and prayers. Senseless violence,” was the first tweet. As the tag spread, he and other users began to put forward the argument that the faith of the victims was limiting coverage of the case. 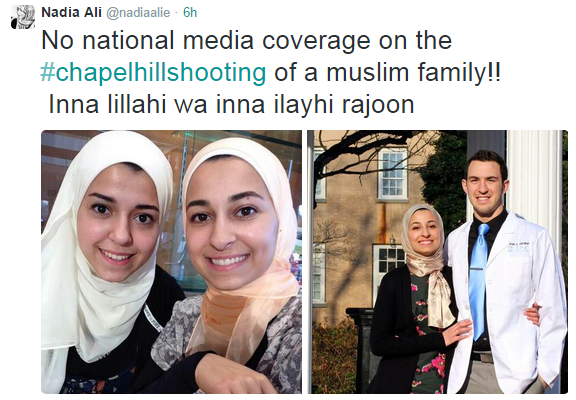 Why hasn’t anyone called the #ChapelHillShooting an act of terrorism? Are the victims the wrong religion? I believe it is an act of terrorism against Muslims. But oops, I said that? Forget I said it. It has not connection with ISIS. I am soooo stupid. I wonder what Benjamin Netanyahu who is coming here to address our congress would say about this now? I wonder? Would he still claim that the biggest threat to the West is Islam? Or would he finally admit that people everywhere who ‘believe they are chosen by God’ do stupid stuff – everywhere. I know why the media ain’t talking about this. Let’s no pretend. White Americans think that America belongs to just them. Let them have all of it. Who cares really? Muslims die, killed, murdered, shot, beheaded. Who cares? This is America. So a white man murders Muslims for absolutely no provocation and I haven’t seen it anywhere in the news. But Charlie Hebdo is all over the news, still. I see, I wonder who subscribes to those news outlets. Could he have killed the Muslims for any other reason than hate? Have you thought about it? Maybe this is just routine homicide and nothing to do with religion? Have you given that a thought? The fact that they are Muslims doesn’t mean they were targeted because of it. I am sure the fact that the people who shot up Charlie Hebdo in Paris were Muslims had nothing to do with the fact that they were Muslims and Charlie Hebdo had insulted their faith for decades. I am sure. Horrible indeed. Just horrible. Plain and simple.